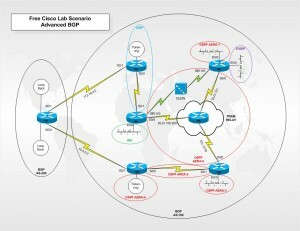 In this lab scenario there are two BGP AS in addition to OSPF, EIGRP, IGRP and RIP routing protocols. This is a timed lab much like that of a CCIE lab. Nine hours have been allotted to complete the lab scenario Good Luck. Verify that you have a working IP setup by pinging the local interfaces on each router. Using a 28 bit subnet mask, configure the ISDN link such that traffic from R3 to R1 will force the ISDN line to dial, but not vice-versa. Confirm IP connectivity across the ISDN link by pinging from R3 to R1. Configure OSPF according to the diagram. Ensure that R3 can still see all the routes. Configure R3 so that the ISDN line will come up if the frame relay connection fails. Configure IGRP on R2 token ring and serial interface S0. Configure IGRP on R1 serial interface S1. Make sure those are the only interfaces advertising IGRP. Redistribute between OSPF and IGRP on R1. Make sure R2 can Ping all interfaces in the OSPF domain. Configure RIP on R1’s E0. Redistribute between OSPF and RIP on R1. Verify R4 can Ping R1’s Ethernet 0 interface. Configure 2 loopback interfaces on Router R7 using the network address 10.0.0.1/8 and 172.16.0.1/16. Configure External BGP on R2 using AS 100. Configure the BGP between router R7 and Router R2 so that R2 can see all three interfaces configured on Router R7. “show ip route” and “show ip bgp” on Router R2 should show the three networks advertised by Router R7. Configure BGP on Router R1, R3, R4 and R5 using AS 100. Make Router R1 a route-reflector neighboring with R3, R5 and R4. A “show ip bgp” and “show ip route” on Router R3 should show the three routes advertised by router R7. Configure a filter on Router R2 that will prevent network 11.1.1.0 from advertising into the AS 100. Configure EBGP on router R4 with AS 100 neighboring with R7. Configure BGP on R2 so that it will be the preferred entry point for traffic from R7 destined for EIGRP loopback interface. a few of my favorites, since I was here There is some stuff. Well this is also an. I need it one of my school projects, fortunately for me mine is on a similar theme as the one here. Glad, happy trails. (c)Copyrighted Free Cisco Lab, All Rights Reserved.